One market analyst whose work I’ve become familiar with and whom I have a great deal of respect for is Tom McClellan. 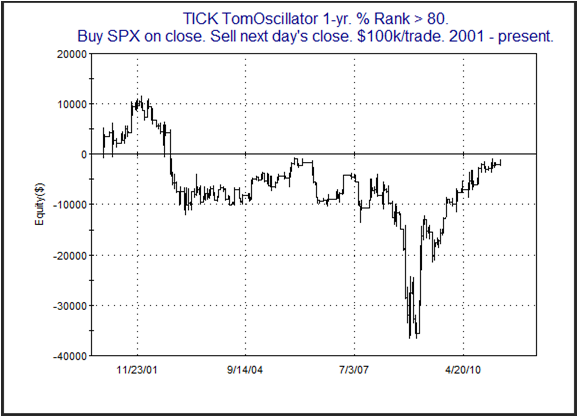 Tom created an oscillator based on the closing TICK reading on the NYSE. The TICK simply measures the number of securites that last traded on an uptick versus. a downtick. The closing value tells you how many finished the day on an uptick versus a downtick. Tom told me he first got the idea to measure closing TICK values from Peter Eliades. The oscillator Tom created takes a 10-day moving average of the closing TICK, then a 10-day moving average of that value, and then subtracts the two. In November 2010 Tom published on his website a detailed overview and description of the indicator. Below is a link to Tom’s article. Tom has demonstrated that, like many overbought/oversold indicators, oversold readings will often lead to a bounce, and the market will often struggle after overbought readings. I’ve done some work with Tom’s TICK Oscillator (which I have begun calling the TICK Tomoscillator.) As a visual indicator it is excellent on its own. But for conducting quantitative research I had some concerns with simply using raw readings. TICK ranges have evolved over time. They are affected by the number of securities traded on the NYSE (which constantly changes), and in 2007 they were impacted by the elimination of the uptick rule for shorting. Therefore I thought it might be worthwhile to use a relative reading rather than an absolute one. To do this I used a trick I learned from David Varadi of CSS Analytics and simply created a % Rank of the TICK Tomoscillator over a defined period. The chart below is taken from the charts page in the subscriber section of the Quantifiable Edges site. (Click here for a free 1-week trial.) 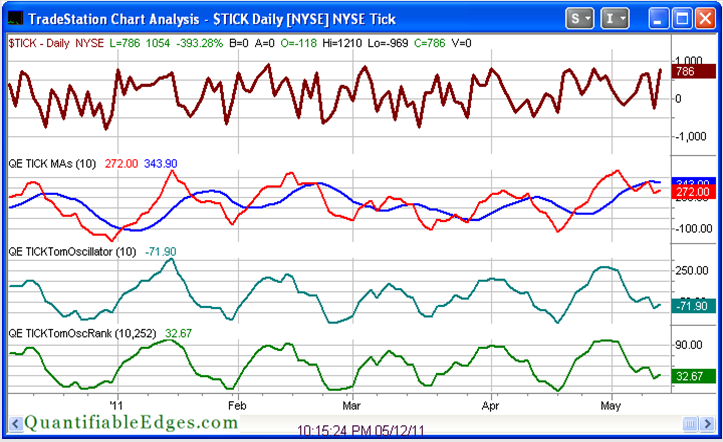 On it you can see the closing TICK moving averages, the TICK Tomoscillator, and the 1 yr. % Rank of Tomoscillator. It isn’t at an extreme currently, but you can see where recent extremes took place. The April 18th dip in the Tomoscillator % Rank marked the market low, and it became extremely overbought at the end of April just before the early May market dip. 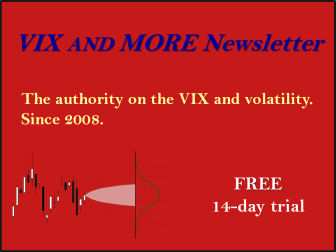 I’ve published a few studies in the Subscriber Letter that have shown very strong edges based on a combination of extreme readings and price action. But even on its own I have found substantial value in paying attention to the TICK Tomoscillator % Rank. Below are two equity curves from some research I published in the 4/19/11 Subscriber Letter. The first one looks at owning the SPX the day after the TICK TomOscillator 1-yr % Rank comes in under 20%. 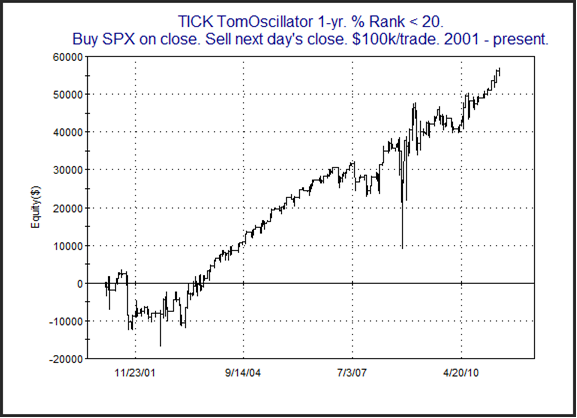 The 2nd one looks at TICK TomOscillator 1-yr % Ranks above 80%. As is clearly demonstrated by the equity curves, closing TICK values, and the TICK Tomoscillator % Rank, are well worth monitoring. Quantifiable Edges subscribers can see the TICK Tomoscillator readings every night on our charts page. 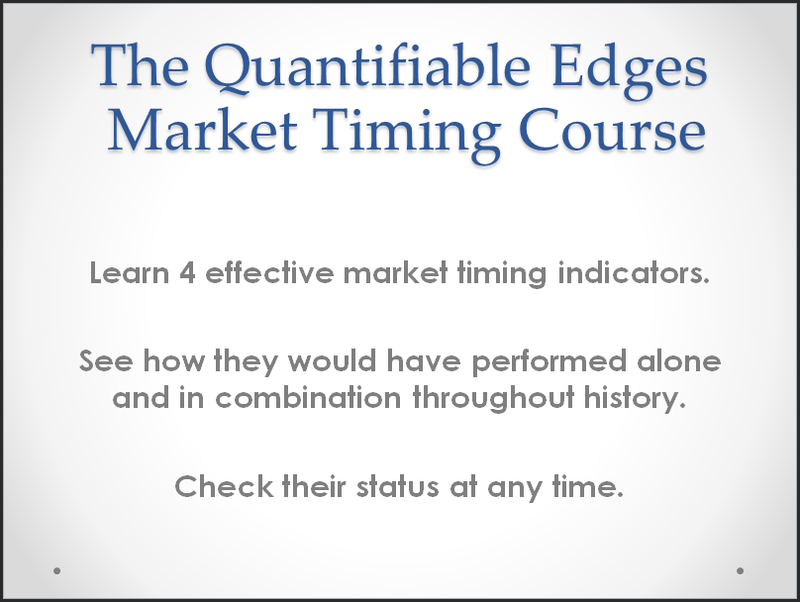 The Tomoscillator indicators are also included in the Quantifiable Edges Tradestation Indicators & Functions package, which is free for all subscribers (or may be purchased by non-subscribers). The code package allows Tradestation users to place the Tomoscillator readings on their own charts and conduct their own research.